Â¡Buenas y bienvenido! This is my first journal entry about my adventures in Spain! I am sure you have all been wondering what sort of trouble I have been getting into. Well, let's get the details out first. When I arrived in the Madrid-Barajas airport, I waited for about 3.5 hours for suitcases that never came. So to start off my Madrid experience I wore the same clothes for about 4 days in a row until one of my suitcases came. I didn't have my second suitcase until yesterday. But it just made me realize that I really don't need much more than food, shelter, and the clothes on my back to survive. Yes, I survived as the smelly girl, but I survived. And it was super-easy to get ready in the morning, and I didn't have to work hard to make myself look good because I had a "valid" excuse. Spain is sooooo beautiful! Muy Hermosa! And contrary to the popular belief about big-city folk, the madrilÃ¨nes (at least the older ones) are actually quite nice and helpful. The campus, Getafe, is really modern, clean, and comfortable. Eventually I will put up pictures of it. We have not had much of a chance to meet many Spanish students yet, but we will when classes start next week. The Marist-Stetson group (there are students from Stetson University in Florida with us) consists of 15 students. I love each and every one of them. . . ;). It is nice to become better friends with the Marist students and get to know the 4 students from the other school. One of them, Christina, lives in my apartment. She lives in Trinidad and was born in Barbados. Her Spanish is a little bit better than mine (at least the speaking part). The understanding part is about the same for us both. Also, yesterday, a girl from France who just graduated from UCLA moved in. She is taking a Spanish language class in Madrid for 8 weeks and living with us for 3. This past weekend, the Marist-Stetson group went to Granada. Granada was the last Moorish stronghold in Spain during the re-conquest. 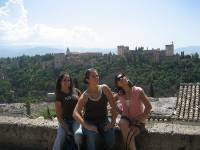 We saw the Alhambra, a majestic Moorish palace that many consider the 8th wonder of the world. We also saw where "Los Reyes CatÃ³licos" are buried (Fernando and Isabella). We were also able to go up to Sacramonte to the caves were the gitanos (gypsies) lived and saw a flamenco performance one night which was pretty cool. But to be honest, the rhythm was really hypnotizing and a lot of us came close to falling asleep. On Sunday morning, I took a little excursion on my own to Santa Fe, where Critobal Colon received permission to sail across the Atlantic from Fernando and Isabella. The only problem was that it was Sunday morning, so it felt like I was in a completely deserted city, and I don't know if I ever actually found the real plaza I was looking for (but I did find a statue of Columbus). But then, I got lost in the neighborhoods trying to find my way back to the bus stops, and a wonderful little lady helped to point me in the right direction. Then I got lost again but ended up finding a Mass at Cristo de la Salud, a little church in Santa Fe. It was really nice, and exactly what I needed. I was lost, and then I was found.  Anyway, then I finally found the buses and got back to Granada, where it took some time and being bothered by a very "friendly" old man who wouldn't freakin leave me alone! After waiting for the number 3 bus that really never was going to come, I just jumped on the next bus going in the right direction towards my hotel. There was an elderly (muy simpatico) woman who spoke 3 languages but NOT English haha who was able to help me figure out where I needed to go. Only when we got close to the hotel did I remember the name of the street and the bus actually ended up stopping just one street away! I got to the hotel just in time to go to Garcia Lorca's house. But the first tour had been at 10 and there wasn't one until 5 so we could not go in. We did take pictures through the windows, though, which was actually better because inside you are not allowed to do it! Ok guys, and this whole no drinking thing to get 2,000 dollars from my parents on my 21st birthday. . .I'm sorry. . .I don't think it is going to happen. I don't drink in the U.S. because I never really wanted to and it was illegal. But here it is a normal part of the culture (not getting drunk, but having a glass of vino or sangria). I was going to try not to drink here because then I would be able to use the 2,000 to come back. But to be honest, I don't know if that will happen, because I can't control the future! I think I should really enjoy the tastes of Spain while I am here. So, for those of you rooting for me, I am sorry to let you down. Pa'luego es tarde! I have no intentions of going to get drunk, but I will have a glass or two here or there. Tomorrow, we have una copa con nuestros profesores (cocktails with our professors), and I am going to have a glass of wine dangit! Anyway, love yousall. Miss you too, but I don't really want to come back home at this point. ;) I'll keep you updated! P.S. I talked with Dani Sanchez today for those of you who know him! And we talked in SPANISH. It was fun. Pues, me voy. Hasta luego!